The first of my S & S socks is finished and blocked. Now, let's see if I can make the second one match up with the first. I didn't make a note of exactly where in the blue section I started when I cast on for the first sock. It might take more than one try to get it right. There'll be no second sock syndrome for me this time around. 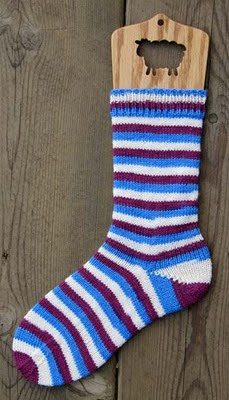 The second sock will be started right away and I have another single sock in my knitting bag when this pair is finished. Finishing. What a concept! Finishing is a good thing! It gives a sense of accomplishment and lets us forget all the other UFO's.